Sushi Go! is a delightful, light card game that plays in about 15 minutes. Your goal: rack up the most points by collecting yummy sushi dishes as you Pick, Play and Pass each turn. Yep, it’s that simple. Each turn, players simultaneously Pick a card from their hand and place it face down in front of them. When everyone is ready, players Play their chosen card by turning it face up, then Pass their remaining hand to the next player clockwise. Players then look at the cards passed to them, Pick a card, Play it and Pass the rest. The round continues in this manner until all of the cards have been played. After which, you score everyone’s points, deal a new hand of cards and play another round. The player with the highest score after three rounds wins. Ok, so that’s the nori, the seaweed wrapper on the outside of the game. The true meat of the game, or in this case fish, is in the cards. The charming illustrations of sushi (7 types), Wasabi, Chopsticks and Pudding are bright, fresh and delightful. As you select and play cards they remain face-up in front of you until the end of the round; it’s helpful to group them by type. Two types of cards have a special effect you can use on a later turn: Wasabi and Chopsticks. 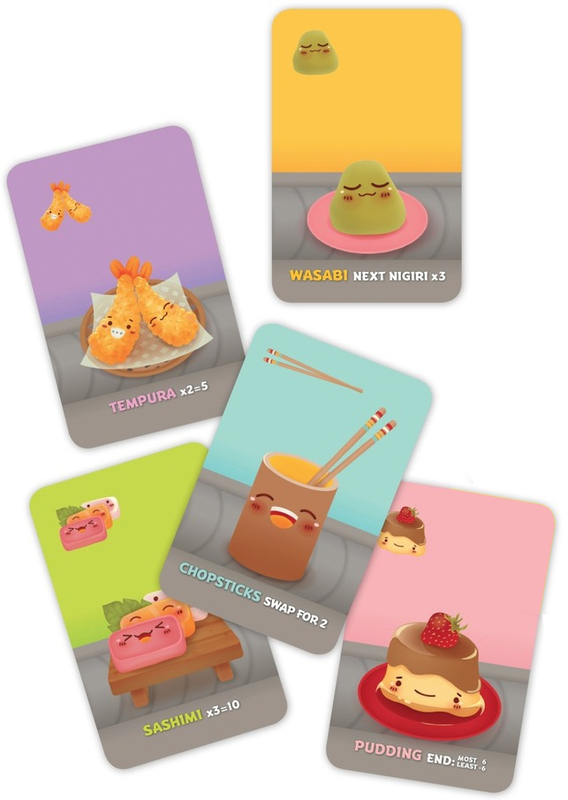 Wasabi gives the next Nigiri card you play an extra zing, in effect, tripling its value! If you have an unused Wasabi card in front of you when you play a Nigiri card, you must place the Nigiri card on top of the Wasabi card to show it’s been flavored with Wasabi. Chopsticks allow you to take two sushi cards on a future turn! To use Chopsticks already in front of you (not in your hand), choose the first card you want as usual, then before everyone reveals their cards, yell “Sushi Go!” and take a second card from your hand, also placing it face-down on the table. Before passing, put your Chopsticks card back in your hand so another player can take and use it. Score 6 points if you snagged the most Maki Rolls, 3 points if you have the second-most. Make sure everyone counts the number of Maki Roll icons on their cards, not the number of cards themselves. For every two Tempura you have, score 5 points. A single Tempura might make a tasty snack, but isn’t worth any points. Sashimi only score when in sets of three, but each set of three is worth 10 points! Yum. Dumplings are worth 1 to 15 points, depending on how many you grabbed: 1 dumpling earns you 1 point, 2 dumplings – 3 points, 3 dumplings – 6 points, 4 – 10 points, and 5 dumplings a whopping 15 points! Go Dumplings! Wait, that’s not the name of the game. Nigiri come in three flavors – squid, salmon and egg – each worth 3, 2 and 1 point respectively. If any of your Nigiri cards have a Wasabi zing (are on top of a Wasabi card), triple their value. Pudding cards only score after the final round, so keep any you acquired face-up in front of you; don’t discard them with your other cards at the end of each round. The player with the most Pudding at the end of the game earns 6 points; the player with the least loses 6 points. Ouch! The player with the most points after three rounds of play wins the game! Sushi Go! 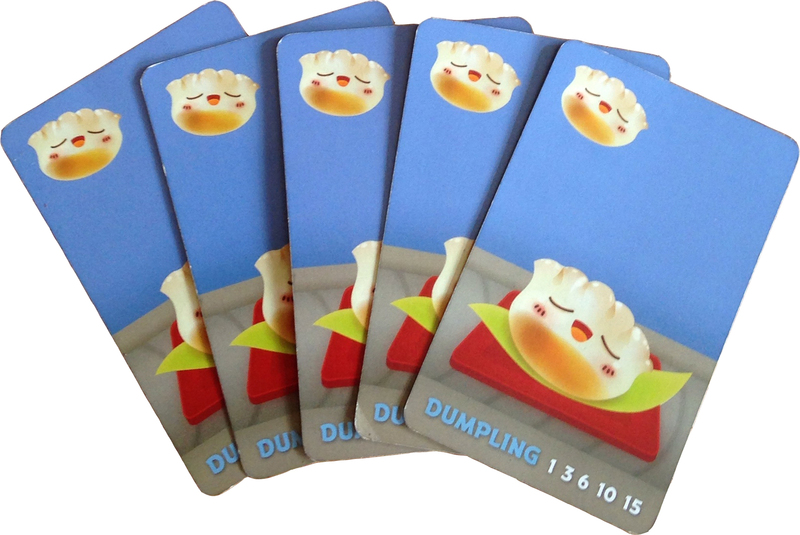 Dumpling cards increase in value, the more you get. Sushi Go! comes in a neat little tin. The cards are bright and colorful with an excellent plastic coating that make them quite durable. The artwork is humorous and adorable. Yeah, I know, gamer guys don’t usually like to hear that a game is cute or adorable – it makes them immediately assume the worst about it. 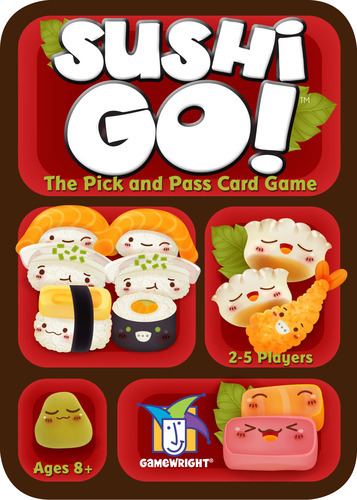 Despite its cuteness, Sushi Go! earned nominations for 2013 Golden Geek Best Card Game and Best Family Board Game. Sushi Go! is perfect for casual gamers or as a light, quick filler game for hard-core gamers. It also makes an excellent family game. While rated for ages 8 and up, I think many younger kids could play it, too. It supports 2 to 5 players and plays in 15 to 20 minutes. Playing time doesn’t increase much with additional players thanks to the simultaneous action selection mechanic. I’m curious to see if it would work to put two decks together in order to accommodate 6 to 10 players. tagged with card drafting, set collection, Sushi Go!